A Scot who gave her life to help protect Jewish schoolgirls during World War Two has been honoured in Hungary. Jane Haining, from Dunscore, worked at the Scottish Mission school in Budapest in the 1930s and 1940s. She refused to take advice to return to her homeland, saying the children needed her in "days of darkness", and ended up dying at Auschwitz. 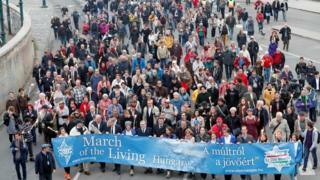 Ms Haining was remembered at the March of the Living in Budapest to mark Hungary's Holocaust Memorial Day. The torchlight procession - expected to be attended by more than 10,000 people - is an annual event. This year it commemorated the life and work of Ms Haining. It followed the publication of a book which showed she had helped to save "many" Jews during World War Two. Scottish Secretary David Mundell led the march and spoke at the event. He said it was a "huge honour and a great privilege" to take on the role. "An extraordinary, brave and selfless woman, Jane Haining sacrificed herself to protect Jewish schoolgirls in Budapest during the Second World War," he said. "Her unwavering devotion saw her lose her life in Auschwitz 75 years ago, aged just 47. "She is a hero of which all of Scotland, Hungary and the world can be proud." Rev Aaron Stevens, minister of St Columba's Church of Scotland in Budapest, said Ms Haining's story remained an important one to tell. "Jane Haining's service and sacrifice shows that caring for people from different backgrounds in no way compromises our faith," he said. "In fact, it just might be the fullest expression of it. "Since I've had a chance to hear women share their childhood memories of the Scottish Mission, I treasure every opportunity to pass on those stories."